No compensation was received for this post. Content and a complimentary prize pack was provided by Chi-Chi's. During the "Salsabration", fans will have the chance to win free merchandise, dance in a virtual conga line, and snack on an endless supply of CHI-CHI’S zesty salsas and chips. Of course, you can also enjoy the fiesta experience at home with your family. In a world where everyone is glued to their phones, CHI-CHI’S wants to help people connect with each other—and with the moment—over tasty chips, crowd-pleasing salsa and fun times. At our house, we are fans of Mexican food. Whether it is a snack of chips and salsa in the evening, or a quick dinner of quesadillas, chips and tortillas are a staple at our house and part of nearly every shopping list. Chi-Chi's can help bring the fiesta to the table by adding a zesty kick to your favorite meals. CHI-CHI’S products are made from quality ingredients, including real tomatoes, vegetables, and flavorful seasonings. For more information about CHI-CHI’S, please visit www.chichis.com, become a fan on Facebook or follow us on Pinterest. For those who are not able to attend one of the games, no worries because I’ve got a special surprise—you too can host your own “Salsabration”! 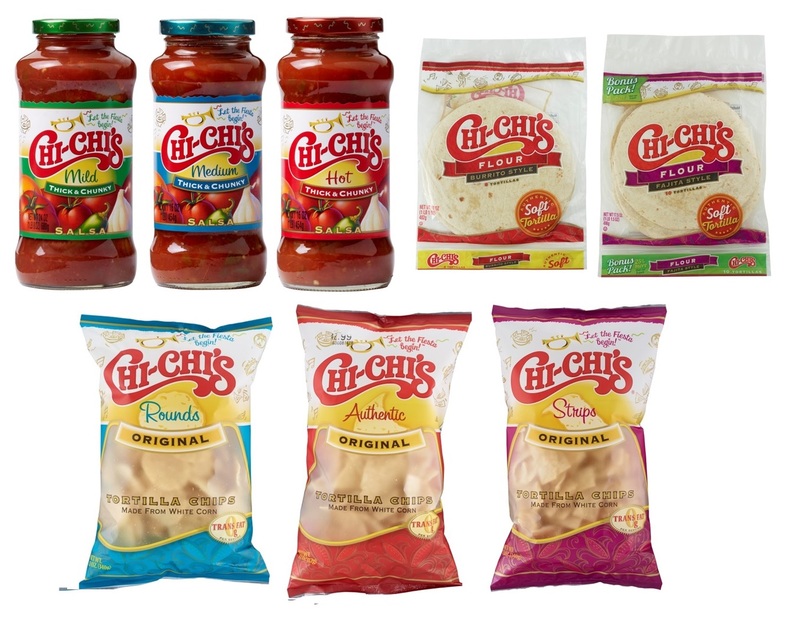 CHI-CHI’S is offering one A Busy Mom of Two reader the chance to win a giveaway prize, including chips, salsa and tortillas to make your gatherings and celebrations more enjoyable and irresistibly flavorful. Giveaway will remain open through November 12th. Giveaway is open to residents of the US only. Winners will be selected through Rafflecopter. The winners will have 24 hours to respond or a new winner will be selected. No compensation was received for this post. The content of this post and the prize pack were provided by Chi-Chi's. All opinions expressed are my own or that of my family. We eat a ton of tortillas in our home, and the fajita style tortillas are my favorite. I would have to say the Chi Chi's Mild Mango Salsa. I love the mild pineapple salsa! It is so good! We like CILANTRO SALSA Medium. I love the mild or medium salsa the best. We have always bought the Restaurant Style salsa (mild), but now that I am seeing these other comments I want to try the mango and pineapple varieties! Fajitas style tortillas are wonderful. The Restaurant Style Salsa looks good. I like the medium chunky salsa. I went to their site and I would most like to try the CILANTRO SALSA Medium. One of our favorite products is the Mild Mango Salsa. The mild mango salsa is calling my name!! I would love to try the mild pineapple salsa. I love pineapple! I like the Chi-Chi's Medium Salsa the best. I would love to try the Cliantro Salsa! My family likes the medium thick and chunky salsa. Oh I have to say the ChiChi's Corn cake mix! I like the Chi-Chi's Snackers Mild Salsa. They are great for on go. I like the Mild Mango Salsa. The Medium Cilantro Salsa looks great.